The Swan Islands are located in the northwestern Caribbean about 90 miles off the coast of mainland Honduras, latitude 17 deg. N. and longitude 83 deg. W. Three islands constitute the Swan Island chain. Great Swan, Little Swan, and Booby Cay. Fringing reefs are developed around the perimeter of the islands with the most extensive reef growth occurring along the northern shores. Great Swan is nearly two miles in length with a maximum elevation of 68 feet. Little Swan is about 1.5 miles in length by 0.3 miles wide with a maximum elevation of 78 feet. Booby Cay is a small cay off the southwestern tip of Great Swan only about 100 yards long. One can easily walk to the cay from Great Swan at low tide. The climate on the islands is about the same as that of the surrounding seas with daytime average highs in the 80's and overnight lows in the 70's. August is the hottest month, averaging about 83 degrees and January is the coldest with an average of about 78. Rainfall averages about 50 inches per year but is quite variable (37-80 inches). The driest seasons are from January to May, and the wettest are from June to December (Weigel, 1973). The islands have had an interesting history. The following historical information was taken from an article written by Edwin Weigel published in NOAA (1973). The islands were named after Captain Swan, master of the CYGNET. He was sent to the Caribbean by London merchants with a cargo to sell. His ship was reportedly attacked by Pirates in 1680 and he was forced to join them. It is believed that Captain Swan may then have become one of the buccaneers who dominated the area. According to information obtained from an interview of Sumner Smith by a reporter for the New York Times, Richard Severo, Mr. Smith's family had been part owner of the Swan Island Commercial Company who took title to the islands form Captain Alonzo Adams, who had sailed there from Mobile Alabama in 1893 and staked a claim. In the early 1900's the Swan Island Commercial Company leased part of Great Swan to the United Fruit Co. which planted thousands of coconut palms. The company pulled out after a time. The company provided weather data for hurricanes from from 1928 until 1932. The U.S. Weather Bureau established a part-time weather station there in 1938. It was manned only during hurricane seasons. It became a year-round operation in the early 1940's. In the late 1940's, after World War II, the U.S. Agriculture Department used Great Swan as quarantine station for Latin-American cattle destined for the U.S. The project was abandoned in 1949. An aircraft radio-navigation beacon was installed on Great Swan in 1946 for guidance of Caribbean air traffic. It was operated by the FAA until 1971 when the FAA pulled out leaving only the U.S. Weather Service. 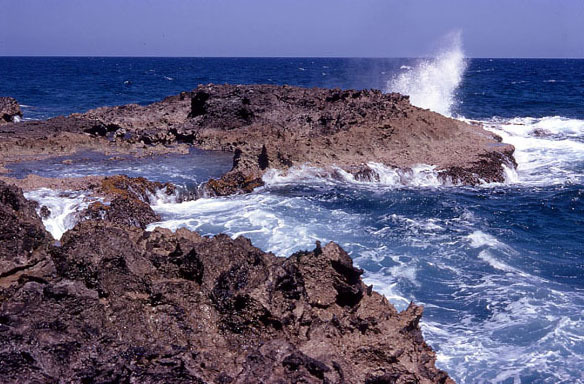 In 1960, a census was taken of the island by the U.S. Coast and Geodetic Survey. There were 28 people living on the island, 19 Caymanians, three Hondurans, and 6 U.S. citizens attached either to the Weather Bureau or the FAA radio station. In 1960, a 50,000 watt radio station was set up on Great Swan and began broadcasting programs in Spanish. This occurred shortly after Fidel Castro took over Cuba and was denoted by Castro as being a propaganda voice for expatriate Cubans. The station was reported to be owned by a New York Firm, the Gibraltar Steamship Company which did not operate steamships. The station, known as Radio Swan, was changed in 1961 to Radio America and the headquarters moved to Miami. Shortly after this the Kennedy Administration began negotiations with the Hondurans to settle a dispute over the sovereignty of the islands. The Honduran Government had laid claim to the islands in the 1920's but did not press the claim until the 1960's. They maintained that when Columbus made his maiden voyage to the New World, he stopped at the Swan Islands in 1502 to pick up wood. 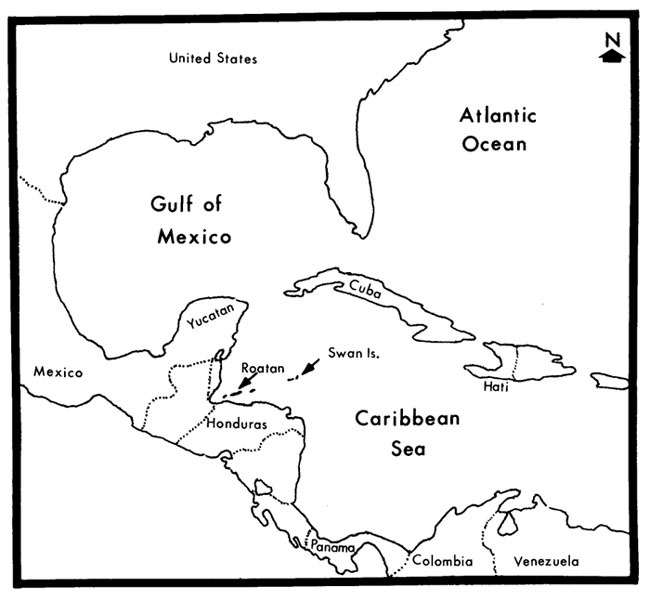 This, they claimed, made the islands part of the Spanish colonial empire to which Honduras was the rightful heir. The U.S. Government said that Secretary of State William Seward laid claim to the islands for the U.S. in 1863. The Government said that George White landed on the islands in 1857, claiming them for the U.S., and that a commercial company began exporting guano in 1858. Sumner Smith tried to press his claim in a court suit but a federal judge ruled in favor of the U.S. in 1970 clearing the way for the transfer to Honduras. The transfer was made to Honduras in 1972 with the agreement that the U.S. would continue to operate the weather station. I visited the islands with two other professors in 1973 and again with a graduate student in 1974 to study the biota, especially coral reefs. We flew to the island from Grand Cayman on a DC-3 which carried mail to the weather station personnel once every two weeks. We landed on a 3800 ft. grass landing strip. The U.S. weather station on Great Swan served as a key station in forecasting hurricanes that may affect Central America and the Gulf of Mexico. The 35-acre compound was located on the western end of Great Swan just east of Mack Point. There was a power generating plant that operated on diesel fuel. There was one brackish water pond near Buffalo Point, but no natural source of fresh water. Rainwater, collected in cisterns built by the U.S. Weather Service, was used for drinking and bathing. The weather station had good facilities. There was comfortable housing (barracks) for the station's personnel and a house they called the "Ranch House" which was sometimes used by the operations director and visitors. It was located outside the main compound. The principal habitat types on the islands are coral reefs, Thalassia flats with loose coral rubble, rocky shores, sand beaches, grassy fields and heavily wooded areas. Thirty-two species of brachyuran crabs were reported by Keith (1985). None of the species were limited to the islands and most ranged throughout the Caribbean. Keith, D.E. 1985. Shallow-water and terrestrial brachyuran crabs of Roatan and the Swan Islands, Honduras. Sarsia 70: 251-278. Weigel, E.P. 1973. Great Swan Island - Hurricane Sentury in the Caribbean. NOAA 3(2): 20-27. Names are those used by the U.S. Weather Station which was in operation when I was there in 1973 and 1974. These names will correspond to those used in the following photographs.